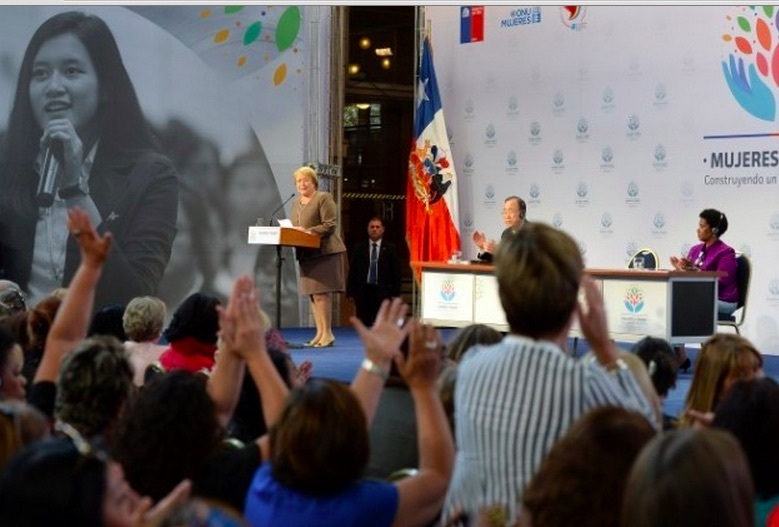 SANTIAGO, Mar 3 2015 (IPS) – Women leaders from every continent, brought together by U.N. Women and the Chilean government, demanded that gender equality be a cross-cutting target in the post-2015 development agenda. Only that way, they say, can the enormous inequality gap that still affects women and children around the world be closed. Chilean President Michelle Bachelet during the closing ceremony of the international meeting “Women in power and decision-making: Building a different world”. “We celebrate that there has been progress in these last twenty years (since the Fourth World Conference on Women in Beijing) in this area…and the evidence is all the people around who came, shared their experiences, the good, the bad, the struggle ahead, the challenges ahead,” U.N. Women Deputy Executive Director Lakshmi Puri told IPS. And while “some countries have made no progress at all, some countries, some progress, and some countries better progress, no country has reached what we should need to reach,” she added. “If you’re talking about poverty, you need voice, participation and leadership for women, if you’re talking about economy, you need voice and participation, if you’re talking education, you need women – both education for voice, participation and leadership, capacity-building, and you need them to be leaders in education,” she said. The high-level event, “Women in power and decision- making: Building a different world”, held Feb.27-28 in the Chilean capital, assessed the advances made towards gender equality in the last 20 years and what still needs to be done. One example raised at the meeting was the failure to reach the goal on gender balance in leadership positions. The participants also discussed the route forward, towards the Sustainable Development Goals, for the period 2015- 2030, designed to close gaps, build more resilient societies, and move towards sustainable prosperity for all. The SDGs will replace the eight Millennium Development Goals (MDGs), which set out the international community’s collective development and anti-poverty targets for the 2000-2015 period. The women leaders meeting in Santiago demanded that gender equality be mainstreamed into the 17 projected SDGs to prevent the progress from being slow and uneven, as it has been in the last 20 years in the case of the Beijing Platform for Action agreed at the Fourth World Conference on Women in September 1995. . . .